Antifa anarchists have decided that an excellent way to “smash the state” is to inconvenience their friends and neighbors by sabotaging ATM machines — in a city that voted 73.3% for Hillary Clinton and only 17% for Donald Trump. 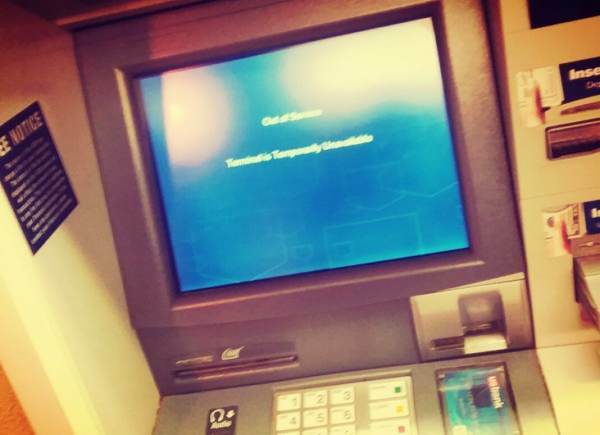 In a communique posted to the Antifa website It’s Going Down, an anonymous criminal admitted to using guerrilla tactics to “wreck” ATM machines in the ultra-blue city of Portland, Oregon — and encouraged readers in other cities to do the same. “We are no longer willing to wait for the some great spark to cause the Revolution, nor can we afford to wait as our mental health depreciates with each new bit of bad news about our dying planet and all these warring nations fighting over blood and oil. Instead, we will turn every little act into an act of rebellion and refuse to submit to the State any longer,” the criminal wrote. Finally, someone on the left admit that their side is suffering from severe mental health issues! The anonymous contributor then claimed to have borrow the tactic from “comrades in Philly” and went out with a group of friends to inconvenience people with their vandalism. “We attempted first to lodge rectangles of non-corrugated cardboard into the slots on the ATMs, but found that the machines wouldn’t accept our counterfeits. In a split second decision, we ransacked the closest big box grocery store for all the Visa gift cards we could stuff into our pockets. We cut off about a third of these, so as to make them that much harder to fish out of the machines, and processed to gallivant across Portland jamming every machine we came across. In total we managed to wreck almost 20 ATMs, although we shall have to see how long it takes the banks to repair them,” the anarchist wrote. “While our actions will not make the State crumble tomorrow, they allow us a bit of sanity and self-confidence which has been stolen from us,” the author, rather hilariously, admitted at the end of their call for crime.